Then things went got busy. I knew January was going to be a fairly busy month, and a weekend away for family stuff was already factored in to my schedule. However, a fault on my car lost me innumerable hours waiting for rescue, collecting rental car(s) and taking a whole day to pick up my repaired car a fortnight later. I thought I would get some time to at least blog about this whilst on a work trip to Germany for what should have been a straight forward datacenter install turned in to the week from hell with no spare time at all. My tux didn’t come back from the cleaners! An old friend came in from out of town! Someone stole my car! There was an earthquake! A terrible flood! Locusts! IT WASN’T MY FAULT, I SWEAR TO GOD!!! ZX Spectrum is actually quite a complex beast. It has 16K ROM, which immediately makes it tricky for the RC2014. The colour video output is quite difficult, and needs 12V AC, and the overall component count just makes things big and expensive. Probably best not to start off with this one. Jupiter Ace is much simpler than the Spectrum, and uses off the shelf logic chips. Overall it is fairly straight forward to follow, however, it has strangeness going on with the video RAM and user RAM, with 6 x 1k RAM only allowing for 3k to be addressable. Hmmm… also probably not best to start with this. ZX80 is much more straight forward. Simple memory, logic and video signal generation. 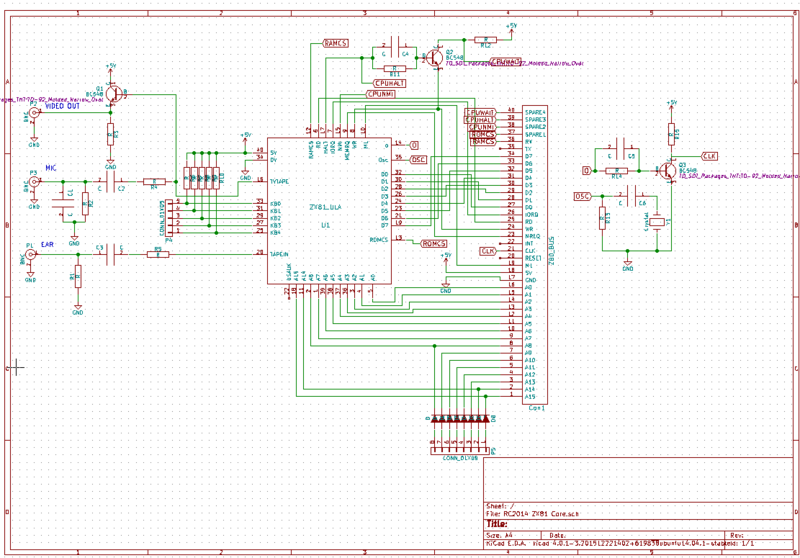 It’s easy to follow and uses standard logic chips – albeit a lot of them. 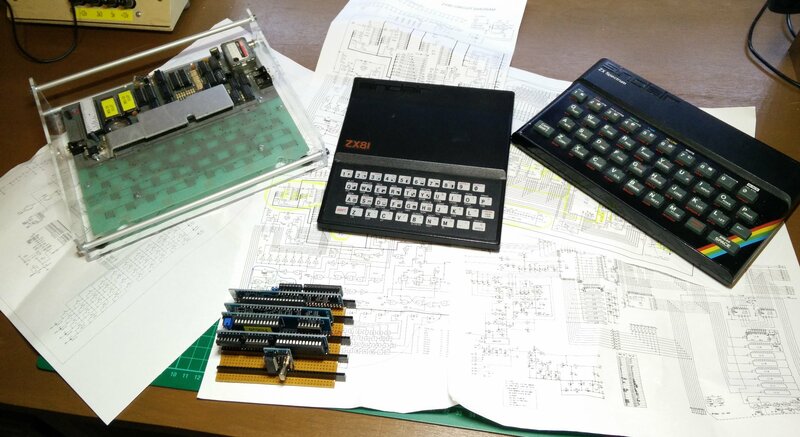 The ZX81 really isn’t very different to the ZX80. Essentially, all the logic from the ZX80 is housed in a single 40 pin ULA (Uncommitted Logic Array) with some ancillary support components. The ROM is slightly better and the keyboard is better too. As time was running out, based on the simplicity and low component count, this was the winner. For low volume, quick turn around PCBs, I always use OSHPark. At just $5 per square inch, with 3 copies of the board being supplied in just over a week, they can’t be beaten. Also, the purple looks just beautiful! Sadly, I was out of the country when the boards arrived, and with today being the last day in January, I had to make the choice of putting these together, or writing this blog post. Obviously, I opted for the blog post, but don’t think that this project will be abandoned. Without the time constraints that I’ve had so far this month, I should be able to work on this at my leisure.